Eltronicschool. - This is a book for you who want to complete your reference to learn more about robotic system control. 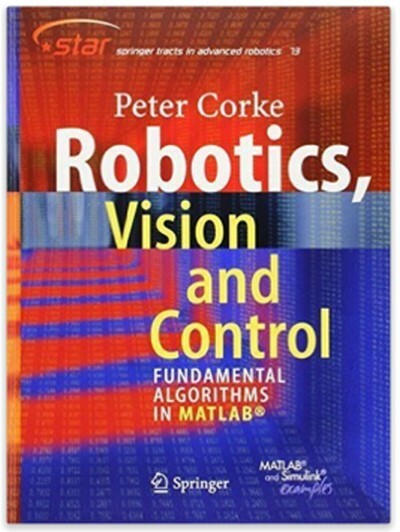 This book is titled with Robotics, Vision and Control: Fundamental Algorithms in MATLAB that authored by Corke, Peter. In here beside we will give you global description about this a book, and then we will give you link to take free download e-book Robotics, Vision and Control: Fundamental Algorithms in MATLAB by Corke, Peter from external server. The practice of robotics and computer vision both involve the application of computational algorithms to data. Over the fairly recent history of the fields of robotics and computer vision a very large body of algorithms has been developed. However this body of knowledge is something of a barrier for anybody entering the field, or even looking to see if they want to enter the field ― What is the right algorithm for a particular problem?, and importantly, How can I try it out without spending days coding and debugging it from the original research papers? The author has maintained two open-source MATLAB Toolboxes for more than 10 years: one for robotics and one for vision. The key strength of the Toolboxes provide a set of tools that allow the user to work with real problems, not trivial examples. For the student the book makes the algorithms accessible, the Toolbox code can be read to gain understanding, and the examples illustrate how it can be used ―instant gratification in just a couple of lines of MATLAB code. The code can also be the starting point for new work, for researchers or students, by writing programs based on Toolbox functions, or modifying the Toolbox code itself. The purpose of this book is to expand on the tutorial material provided with the toolboxes, add many more examples, and to weave this into a narrative that covers robotics and computer vision separately and together. The author shows how complex problems can be decomposed and solved using just a few simple lines of code, and hopefully to inspire up and coming researchers. The topics covered are guided by the real problems observed over many years as a practitioner of both robotics and computer vision. It is written in a light but informative style, it is easy to read and absorb, and includes a lot of Matlab examples and figures. The book is a real walk through the fundamentals of robot kinematics, dynamics and joint level control, then camera models, image processing, feature extraction and epipolar geometry, and bring it all together in a visual servo system. And now you can use link below to take free download e-book Robotics, Vision and Control: Fundamental Algorithms in MATLAB by Corke, Peter from external server. Please click link below to download this e-book easily.